A statement issued from The National Space Society's headquarters in Washington DC. The National Space Society (NSS) congratulates SpaceX on the successful June 3 launch of a re-used Dragon capsule from historic Launch Complex 39A at NASA's Kennedy Space Center as part of the Commercial Resupply Services 11 (CRS-11) mission to resupply the International Space Station (ISS). This was the 100th launch from LC 39A. The SpaceX Falcon 9 made history on June 3, 2017 at 5:07 p.m. EDT by lofting a "flight proven" Dragon capsule toward the ISS. SpaceX successfully returned the Falcon 9 first stage to the launch site for later re-use. This was the first time a private company has flown a re-used orbital craft. The most significant re-used orbital spacecraft prior to the Dragon were the now retired Space Shuttle and the currently operating Air Force/Boeing X-37B space plane, but both were government owned. The Dragon capsule that rocketed through the Florida skies today previously flew as part of the CRS-4 mission in September 2014. NSS also congratulates ViaSat on another milestone, which occurred on June 1: the successful Ariane 5 launch of communication satellite ViaSat-2 (manufactured by Boeing), launched with Eutelsat 172B from Kourou spaceport in French Guiana. "ViaSat-2 is going to be the highest-capacity satellite ever launched, with about 300 gigabits (per second) of total capacity, which is more than double what we had on ViaSat-1, which was launched less than six years ago, and more than 40 times the capacity of WildBlue 1, which was launched by Arianespace about 10 years ago," said David Abrahamian, director of space systems at ViaSat. "So that shows you just how fast the technology is moving." "Both SpaceX and ViaSat are taking significant steps forward in the developing space economy," said Dale Skran, NSS Executive Vice President. "SpaceX has previously demonstrated re-use of a flight proven first stage and attempted to recover fairings. NSS thanks NASA for its on-going support of SpaceX's technology development program with Space Act Agreements and service contracts." The re-use of the Falcon 9 first stage and the Dragon capsule supports Milestone 2: Higher Commercial Launch Rates and Lower Cost to Orbit of the NSS Roadmap to Space Settlement which can be found at: http://www.nss.org/settlement/roadmap/RoadmapPart2.html . The launch of ViaSat 2 supports Milestone 7: Applications of Space Technology on and for Earth. The Dragon capsule carried over 2,708 kgs (5,970 lbs) of cargo to the ISS. Included in the cargo manifest is the Neutron star Interior Composition Explorer (NICER) that will study the physics of neutron stars. NICER will also demonstrate the use of pulsars as natural beacons to enable spacecraft navigation into deep space. Upon completion of its mission the Dragon will return to Earth loaded with the results of scientific experiments done on the ISS. 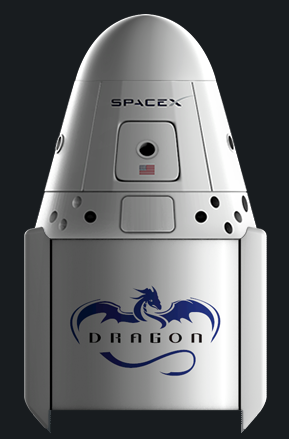 "The re-use of a Dragon capsule is yet another example of how SpaceX uses cargo flights to prove out new technologies that can be later used on crewed flights, and is a key step toward a commercial return to the Moon," said NSS Senior Vice President Bruce Pittman.